To enable community members and other stakeholders to meet regularly to monitor progress towards agreed goals and are able to identify and tackle challenges. Based on issue to be discussed, volunteers to invite key government authorities and those community members to who are impacted by the issues to discuss progress, challenges and solutions, etc. Meeting minutes to be documented, for example using the template below. 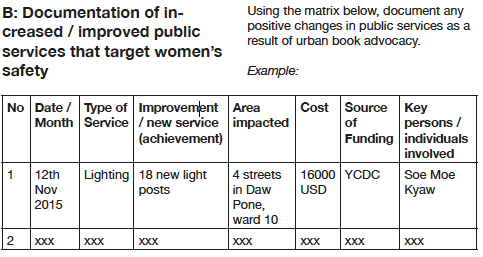 Positive changes that have been observed as a result of the project or programme should also be documented (see example B below). This tool helps in making community facilitators and leaders know where they are and needed action to take to improve their well being.